It was an alien symbol after all. ... In 2002, [Leonard Nimoy] published “Shekhina,” a book of about 40 photographs that explore his interest in the feminine aspects of Jewish divinity. Many of the images are on display this month at the R. Michelson Galleries in Northampton. 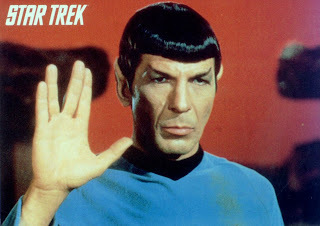 It’s an idea that was planted with Nimoy when he was about 8, although he didn’t fully realize it until a few years ago. During a segment of high holiday services at his Orthodox synagogue in Boston, members of the congregation stood before the assembly to deliver a special blessing. Standing with his brother, father and grandfather, Nimoy was told not to look at the men as they chanted the prayer. But he took a peek, and saw the men swaying with their arms outstretched and their hands splayed in the manner he would later use as the Vulcan greeting in his “Star Trek” role. 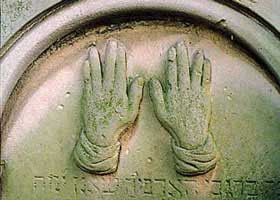 The hand symbol represents the first letter of a Hebrew word for God [shin, Shaddai]. For decades, Nimoy didn’t know why the congregation was not supposed to look as the blessing was being given. A few years ago, he finally asked the rabbi at Temple Israel of Hollywood, the reform synagogue he now attends. There are more than a few things taken from Judaism and Jeiwsh culture in Star Trek, most especially in the original series and "The Next Generation". The later series ("Deep Space Nine" and "Voyager"), however had more than a few espisodes that seemed like political statements in support of the Palestinians. As well, the series made after creator Gene Roddenberry's death--"Deep Space Nine" and "Voyager"--were very "Theistic" (i.e. supporting the existence of God), unlike the ealier series, which carried Roddenberry's atheistic slant. You may also want to look into the Kabbalist/Judaic elements in the recent(episodes I thru III) Star Wars trilogy which spoke of bringing balance to the force(balance between the light and dark side). This theme was totally absent in the original and far superior Star Wars trilogy(episodes IV thru VI).